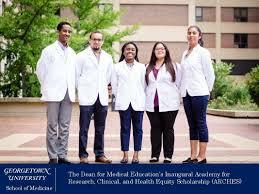 The Dean of Medical Education’s Academy for Research, Clinical, and Health Equity Scholarship (ARCHES) is a six-week program for ten undergraduate students who are rising juniors and seniors interested in pursuing medical studies. Dates: Wednesday, June 26 – Friday, August 9, 2019. Move out day is Saturday, August 10th. Applications are due by February 4, 2019 at 5 PM EST. Apply here! Learn more about the program from their 2018 Fellows! For more information on GU ARCHES, please contact Kimberly Walker at (202) 687-7320 or email gumedarches@georgetown.edu with the subject heading “GU ARCHES Question”. This entry was posted in Research, Scholarships/Resources, Summer Program. Bookmark the permalink.